Home » Vernadsky & LaRouche: There are No Limits to Growth! Any scholar of the work of V.I. Vernadsky who seeks to fashion him as a modern day environmentalist, opposed to the development of human economy and a believer in the idea that human development is not sustainable, is a liar. Unfortunately, this is not an uncommon occurrence. 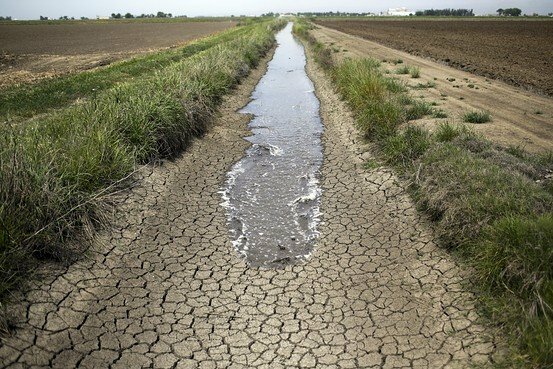 Today, mankind faces a series of crises which are "environmental" in nature, the Western U.S. drought being one example. If mankind is going to be able to approach, let alone solve, such crises on our planet, only an accurate understanding of Vernadsky's ideas, as opposed to what constitutes modern-day environmentalism, will allow us to do so. "Man is profoundly distinguished from the other organisms by his action on the environment. This distinction, which was great from the beginning, has become immense with the passage of time." But today's environmentalists (the Jerry Brown's among us) would impose on such a quotation their own view that this distinction is also the difference between "natural" and "destructive." 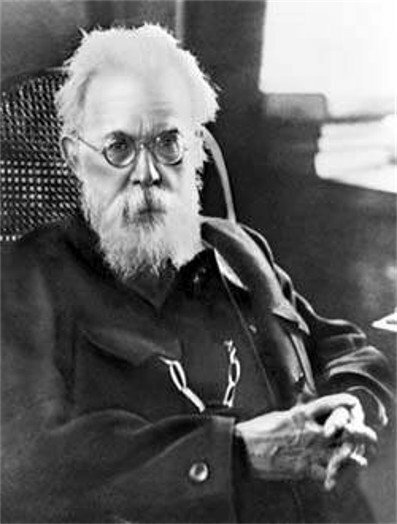 However, Vernadsky’s early presentation on Human Autotrophy, where he outlines the idea that there are no limits to growth when science and human reason are able to reign, and that they should reign, would expose those who would impose their opinions on Vernadsky’s work as a charlatan or worse. Anyone who has read Lyndon LaRouche's textbook on physical economy cited above will find a particular resonance between their ideas. "At the beginning of last century, the imminent scarcity of natural resources was not yet perceived, because the energy at man’s disposal in this era was still largely connected to ancient material forms of existence … To resolve the social question it is necessary to plumb the foundations of human power—to change the form of nourishment and the sources of energy which man uses." "At any level of technology, certain aspects of man-altered nature are the principal "natural resources" upon which raw-material production depends… If this spectrum of the varieties of natural resources required by such a technological culture is depleted, the society is obliged to employ relatively poorer and less accessible varieties of these resources…"
"The reserves of natural resources decrease visibly. If their usage grows with the same force, the situation will become grave. In two generations one would detect a scarcity of iron; petroleum would also quickly become scarce; in a few generations, the question of coal would become tragic. It is the same for most of the other natural resources. The dearth of coal would be particularly grave, because it is coal which procures for man the energy necessary for society in its present form. "This is an inevitable phenomenon, because man uses the stores of natural resources which were formed throughout myriads of centuries and which could not be replenished except in the same length of time. These reserves are necessarily restricted. Similarly if one found other unknown sources, or if one used the less rich or deeper concentrations—one would only push back the date of the critical period—but the troubling problems would remain unresolved." 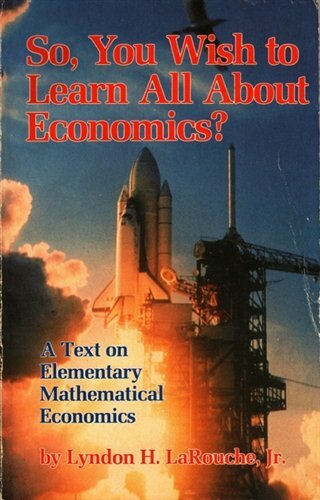 Textbook on the fundamentals of physical economics, So, You Wish To Learn All About Economics?, published by Lyndon LaRouche in 1984. In his economics textbook, LaRouche discusses the fraud of the idea of limits to growth, referencing in particular a book by that name published in 1972 by the Club of Rome. He notes that the authors created a sophistical argument, admitting that it is only without technological progress that there are limits to growth, but using models which discount the possibility of new discoveries which would allow for such progress. "Only societies whose cultures commit them to successful technological progress, as a policy of practice, are qualified to survive and to prosper. Indeed, only such societies are morally qualified to survive, as the society based on the law and culture of Rome was not." "The solution to these problems takes shape as a result of scientific progress outside of all social preoccupation. After generations, science, in its quest for truth, is forced to discover new forms of energy in the world and great organic chemical syntheses. It labors with very insufficient means, the only ones available in human society today, where the situation is in striking contradiction with its [science’s] real role as producer of wealth and of human power. "This scientific movement can be accelerated by creating new methods of research; it can’t be stopped. Because there is not a force in the world which can shackle human understanding in its march, once it has understood, as in the present case, the scope of the truths which are opened before it. "...Until now, the power of fire in its multiple forms was almost the sole source of energy for society. Man obtained it by the combustion of other organisms or their fossil remains. "Some decades ago, he began systematically to replace it by other sources of energy, independent of life—first by hydropower. The quantity of hydropower—the motive force of water—existing on the terrestrial surface was measured. And it was seen that, large as it seems, it is not sufficient by itself for societal requirements. "But the reserves of energy which are at the disposal of reason are inexhaustible. The force of the tides and ocean waves, radioactive atomic energy, solar heat are able to give us all the power needed. "The introduction of these forms of energy into life is a matter of time. It depends on problems whose solutions present nothing impossible." You might still be left wondering, while this is quite interesting, what is meant by "Human Autotrophy" anyway? In fact, in this presentation, Vernadsky's premise is addressing man's reliance on food, and on agriculture, which, as we now see in California, depends directly on resources such as water. Vernadsky addresses the tragedy of great famines which have plagued mankind. While he playfully posits ways that man could get around such dependence (something which would be a very practical consideration for space colonization), he returns to these fundamental questions of principle— that, as he put it, "the reserves of energy which are at the disposal of reason are inexhaustible." This conclusion is not only optimistic, but it is true. As Lyndon LaRouche also wrote in "So You Wish," on the subject of water: "We must not only distribute water supplies; we must manufacture them." In Vernadskian terms, this is a task for the Noösphere.